This Annoying World | Apologies to Joe Pilati, who used the same column title at BU in 1966. A fond tribute to a faithful road warrior and a lament for an identity theft. Lines composed upon a netbook while stranded in an airport. Natural enemies in my own back yard. The horror of grocery shopping and the relentless march of dehumanization. Those bullies? To this day, I wouldn’t cross the street to save their lives. I miss Jerome terribly. Inseparable for years, we covered many miles together. Toward the end, old age and infirmity made him a less reliable travel companion, but I was blind to his faults. Jerome was my 1989 Buick Park Avenue — four doors, moon roof, loaded, jet black with red leather interior. I bought him used, in 1997, already eight years old but with only 43,186 miles on the odometer, for $6000. I named him Jerome after Pittsburgh Steelers running back Jerome Bettis, a/k/a “the Bus” — an homage. Over the course of his next 125,875 miles, we came to depend on each other. We were friends. This sentimental habit of anthropomorphizing automobiles is a family tradition. In my time, I have driven a 1966 Chevy Biscayne named Thane of Cawdor, a 1974 Checker dubbed the Enterprise, a 1977 Impala called Big Youth, and a Jeep Cherokee named Snow White. But none of those (except possibly the Mighty Thane) had as much personality as Jerome did. Jerome was a gentleman brute — a top-of-the-line luxury model with opera lights on his sedan posts; but he could cruise at 80 miles an hour and had a horn to rival a diesel locomotive’s. He never hit a bump I could feel. And this gentle giant was a killer. He was rear-ended twice, both times suffering only cosmetic bumper damage while totaling his assailants. On the road, Jerome commanded respect. Despite the miles, he kept his good looks. In his later years, other drivers saw us coming — gleaming black hulk with now-extinct chrome bumpers and protruding door handles — and assumed that I was a) a classic-car buff who cared too much; b) some joy-riding antique duffer likely to make an irrational driving maneuver; or c) a time traveler. Whatever the reason, nobody cut Jerome off in traffic. Anything smaller than a truck got out of his way. Nobody tailgated Jerome either. A blast from his horn cleared entire highways. Jerome was what they called Real Steel. His engine was bulletproof; I had his transmission rebuilt; and I tolerated the loss of amenities as one by one, the air conditioning, the power antenna, the automatic headlights, even the ventilating fan ceased to function. But in the end, I betrayed him. Jerome and I made our last ride, on four of his six cylinders, to a Toyota dealer, who gave me $1000 trade-in just for being amazing and despite the fact that Jerome, at 16, wasn’t even listed in the Blue Book. I watched with genuine sadness as the salesman ushered the old boy out of sight behind the dealership to await auction. I drove home in a prim used black 2002 Camry. It’s beautifully engineered, well designed, fuel efficient, comfortable enough, simple to operate, and looks just like every other car on the road. And that’s why I really miss Jerome. In Jerome, I was special, an Interstate man of mystery. People noticed; toll takers offered compliments; pedestrians applauded when I parallel parked. Jerome’s replacement is just part of the scenery — unnoticed, unremarkably normal, never complimented. I’d traded something eccentric and funky for something common and sensible, and it felt like defeat. In Jerome, I could be king of the road. Even among peers, I always knew where I stood in the automotive pecking order. 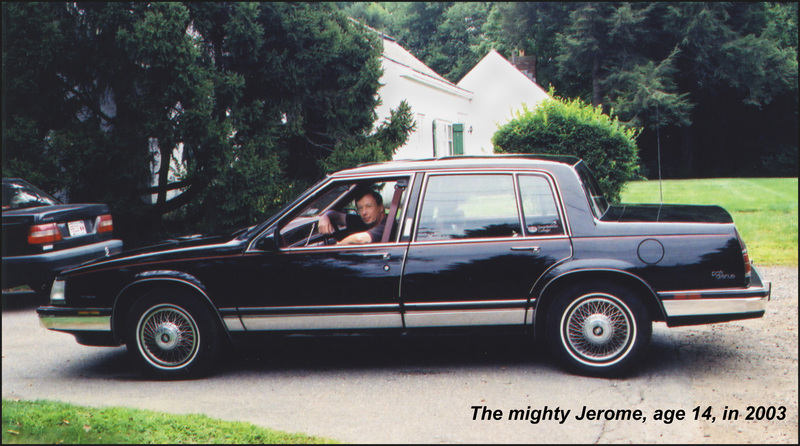 Jerome had the most elaborate tail-light array and the longest roof-line of any full-size late-’80s Buick. Status among peers; and all those lowly Electra drivers knew it. If such subtle distinctions exist among Toyota models, I’m not aware of them, and let’s face it, the king of the road does not drive a mid-size import. Respect? Forget it. My new car has a horn like a bicycle’s; other drivers don’t even look, never mind cringe. People cut me off at intersections and pull out in front of me from driveways. I’m invisible; I’m tailgated. Passed. Numbskulls on cell phones slow in front of me, uncaring. In Jerome, I was feared; now I’m presumed harmless. It’s been a drastic adjustment. I’d gotten used to having some personal space when I drove, and now I’m just part of the pack. I try to put aside false values. I comfort myself that I’m driving a smaller, smarter, cleaner car. I’m trying to adjust, and perhaps, in eight years and 126,000 miles, I’ll embrace the virtues of automotive anonymity. Meanwhile, we’ve named the Toyota Jerry — an homage. Clif Garboden is the former Senior Managing Editor of the Boston Phoenix and an excellent driver. GOTO an ﻿Index﻿ of posts on this blog. My bullying experience was textbook, or perhaps storybook, straight from the pages of a 1950s Boys’ Life. I was in first grade and the youngest kid at the bus stop where the “big kids” frequently stole my hat for taunting games of keep-away or threw my lunchbox over the hill into the nearby creek. They didn’t like my boots. They didn’t like my answers when we compared grades. They didn’t like me because they weren’t especially nice or bright, and probably because their parents and siblings didn’t like them much. Pay it forward. The gleefully delivered ritual indignation went on until one winter day when Donny, a tall-for-his-age fourth grader, “washed my face out” — a then common form of child-on-child assault that involved rubbing some relatively helpless kid’s face with handfuls of snow. I fought back, literally jumping up to deliver a flailing punch to my tormentor’s face. I expected to be killed, of course, but, to the amazement of all, Donny started to cry and ran home. More remarkably, just like the fables about cowardly bullies predicted, the harassment stopped after that. Stand up for yourself, my son, etc. That scene — true story — wouldn’t happen today. (Actually, today, I’d be the one expelled for fighting.) Bullying seems to have changed. On the universal spectrum of hectoring, my episodes (traumatic enough for me, thank you) land somewhere in the territory of “children can be cruel.” This was before the invention of poison-pen Tweets and Facebook defamation. Most low-tech browbeating was randomly dispensed in service of no greater ideal than an age- or size-defined pecking order. Big kids picked on little kids. Our adult supervisors ignored it. Some, apparently, believed it somehow purified us. The bullying we hear so much about today is, by comparison, downright evil, and it’s actively enabled by our schools. Often, the poor misfit being hounded is some student that teachers don’t like much anyway, and so adults turn a blind eye. Worse, some sorry teachers will tactically scapegoat an unpopular pupil in an attempt to win over and control the rest of a class. School boards will deny it, but bullying at school never, ever happens without at least one adult’s tacit sanction. Image-conscious suburban schools have done a pretty good job of minimizing physical bullying, but that’s merely shifted persecution’s arsenal to taunts, threats, and rumor mongering. In my experience, no kid ever said “Sticks and stones can break my bones, but words will never hurt me.” First of all because where I grew up there was always a ready supply of sticks and stones at hand with which to test the claim. But mostly because everyone knows that cliché retort is a lie. Today’s educators try touchy-feely tricks like group reconciliation, a technique my son once defined as “getting everyone into the same room so they can tell you what’s wrong with you all over again.” Bullying can indeed be stopped by a courageous peer or a scolding adult, but heroes are hard to come by these days. What are bullies’ victims to do? There is no good choice: they can A) hate their tormentors or B) hate themselves. Plan A condemns them either to seethe in frustration or to strike out and, inevitably, end up being blamed for the whole situation. Plan B offers a life of cowering despair versus the impulse to attempt an often self-destructive escape. Which brings us to the late 15-year-old Phoebe Prince, a Central Massachusetts high-school girl allegedly bullied unto suicide by verbal pressure applied by a pack of jealous Northampton brats. I don’t cut Donny any slack either. It’s that simple — and that permanent.